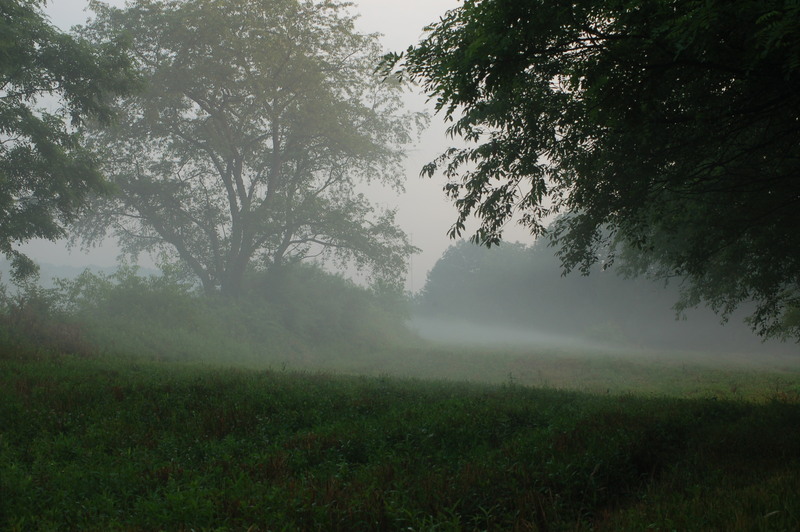 A slight fog at 6:30 A.M.
At least once a year I enjoy the mile long hike into State Game Lands 247 to pursue some carp hunting. I am not actually using a firearm to hunt this specie of fish but my tactics may be similar to hunting. A more correct word might be stalking since I creep around the sedges and wetland grasses attempting to locate a carp by sight. The early morning walk was comfortably cool, but I knew walking out wouldn’t feel so fine. The temperatures were scheduled to rise as was the humidity. I saw two deer sneaking among the woodland trees. I hoped to see a hen and her poults, but tat hope didn’t happen this day. As I came into the vicinity of the pond I began searching and peeking to see if any other critter might be drinking or swimming. Later, I would see a great blue heron circling the pond. The awkwardly gracious bird wanted to feed on the little bluegills of the pond. Many tracks could be viewed in the water’s muddy areas. 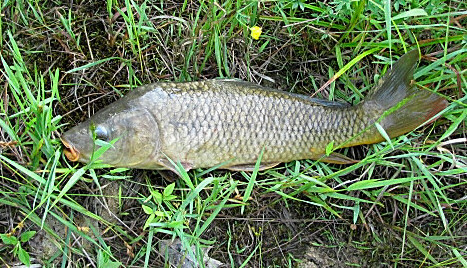 I immediately began seeing some carp slurping in the shallows and among the vegetation. All attempts for me failed. the fish just were not interested in the bait I was casting around them. Since the fish were mostly less than fifteen feet from shore I did not have any weight to aid in distant castings. many of the carp would be observed within ten feet. I would cast around them and the carp simply ignored the bait. I was believing I just might go home “skunked” when my line took a rapid heading of the pond’s center. I set the hook and held on for a few minutes until I could reach into the water and subdue the beast. The carp was between sixteen and eighteen inches. I released the golden fish back into waters. I continued fishing for another ten minutes before packing up to begin a hike out. I chose a different direction to exit the game lands.